Welcome! The Chompers Kids Zone is a Dental Care Network initiatve, aimed to educate you and your children about proper oral hygiene. Looking after teeth is extremely important, especially from a young age, as improper care can lead to nasty plaque and germ buildup, rotting teeth or even tooth loss later in life. How do you prevent against this? No need to worry! The Chompers Kids Zone is here to help keep your teeth in tip top shape and have fun while doing it! 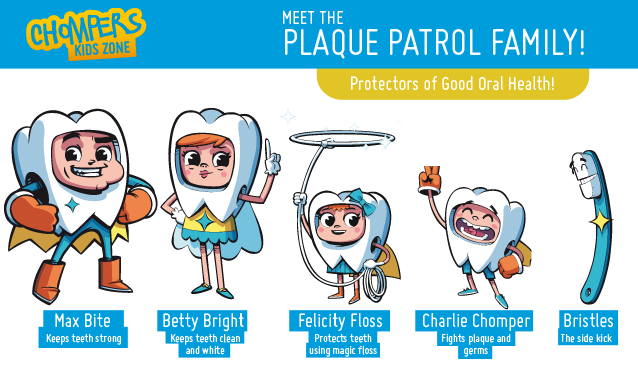 Read on to learn more about the Plaque Patrol Family, the first family to fight plaque using their special powers, helping keep teeth clean all around the world. Don’t forget to also visit the main Chompers Kids Zone website here to download and print off your very own doorhanger, brush chart and dot 2 dot colouring in drawings. 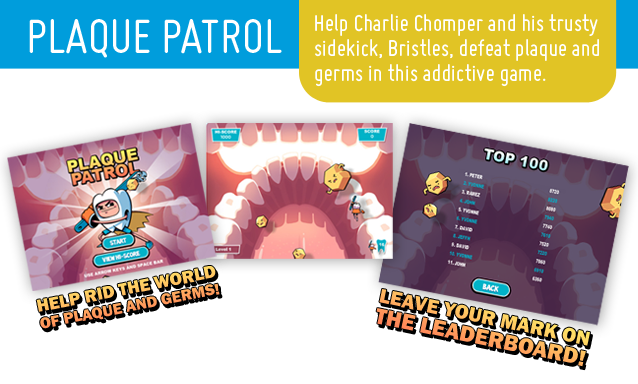 There’s also a fun-filled online game, Plaque Patrol, where you help Charlie Chomper and his trusty sidekick Bristles fight off the invading plaque and germs. Using their special oral hygiene powers, the Plaque Patrol are the first family of good oral health. They fight plaque and keep teeth clean all around the world. Plaque Patrol is an online game where you play the lead role as Charlie Chomper. Along with his trusty sidekick Bristles, you will help Charlie fight off nasty plaque, germs and bacteria lurking inside an infected mouth. Simple to learn gameply and controls help get you cleaning the infected mouth in no time! Increasing levels of difficulty means the further you get, the more you will need to concentrate in order to survive. Compete with your friends for the top spot on the leaderboard and leave your legacy among the Top 100 players.